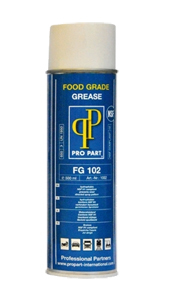 Food Grade Grease FG 102 has excellent mechanical and thermal stability and very good adhesion. The high viscosity of this product makes it very suitable for lubrication of components, which are exposed to high pressure. Because of the unique formula, Food Grade Grease is suitable for use in the food industry. Food Grade Grease FG 102 with PTFE is very suitable for treatment of mechanical parts of metal and plastic. Food Grease has excellent anti-corrosion effects and is waterproof. Food grass Grease has an NSF H1 registration.